Cross stitch pattern from Alessandra Adelaide Needlework. 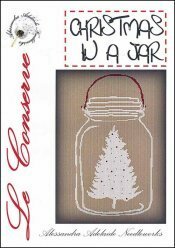 Look, you can have Christmas in a jar by stitching this design! A Christmas tree stands in a mason jar. What a great design to add to your Christmas decor! Stitch count 108w X 198h.